James King, 34, had made and lost a fortune in the banking business in San Francisco in the 1850s. While making his money, King had noted that the industry was replete with crooks. His friends urged him to start a newspaper to reveal corruption and on 8 October 1855 he started the Evening Bulletin. When Charles Cora, a notorious gambler, murdered US Marshal William H. Richardson, and was arrested, King declared that if Cora was allowed to escape justice, the sheriff, David Scannell, must hang in his place. Realizing that the public liked his exposés, King widened his targets. He revealed that James P. Casey, a city supervisor, had once been imprisoned in Sing Sing in New York. On 14 May 1856 Casey encountered King as the latter left the editorial offices of the Bulletin, on the west side of Montgomery Street, just north of Washington Street. Casey ordered King to draw his weapon but the newspaperman was unarmed and told Casey so. Casey pulled out a revolver and shot King. The journalist was taken to a room in the Montgomery Block (now the site of the Transamerica Pyramid), and treated by Dr R. Beverly Cole but he died on 20 May. As news of the shooting spread the 1851 Committee of Vigilance was formed at an old lodge room at Sacramento and Leidesdorff streets.On 20 May, following King’s death, 3,500 members of the committee marched to the Broadway Jail where they demanded Casey be handed over. They later returned to the jail and took Charles Cora away. Both Casey and Cora were given lawyers to defend them; both were tried before a jury composed of members of the Committee of Vigilance and both were convicted. 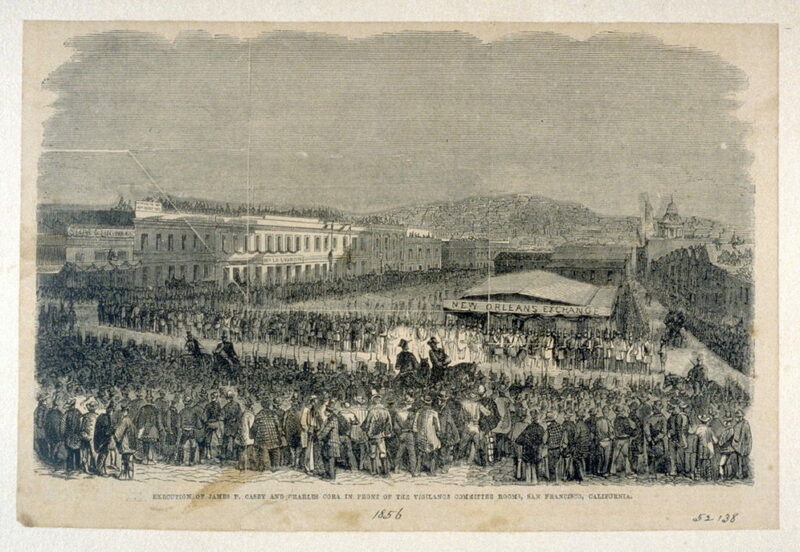 A large crowd filled Sacramento Street to watch the double hanging at 1.20pm on 22 May from a platform extended from the second storey windows of Fort Gunnybags. The noose was removed from Casey’s neck and he was allowed to address the crowd, “Gentlemen, fellow citizens, I am not guilty of any crime. When I am dead… let no one dare traduce my character… I am guilty of no crime. I only acted as I was taught — to avenge an insult… Oh, God, have mercy on my soul! My God! I am not guilty of murder — I did not intend to commit murder.” While all this was going on Cora waited patiently for Casey to finish and then both men were hanged simultaneously. Their bodies hung for an hour before they were cut down and given to the coroner.